Giving credit where credit is due! 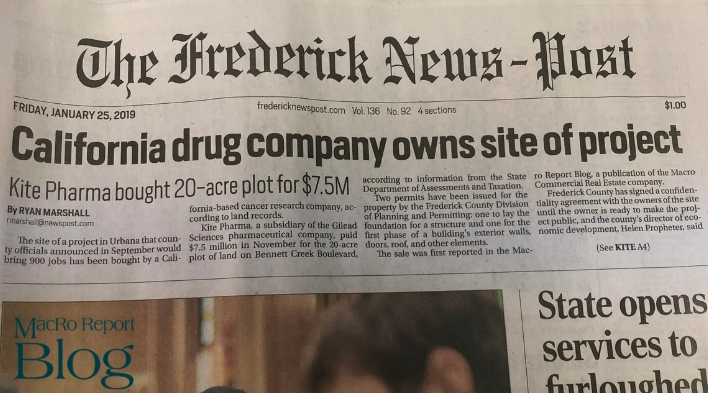 Frederick News-Post credits MacRo to first report the sale of a multi-million project in Frederick County. We were pleasantly surprised when we were reading the front page of this morning’s the Frederick News-Post to see that our weekly Thursday morning MacRo Report Blog post was featured as the originator the big story of revealing which new major employer has made a major investment in Frederick County … and will bring about 900 new jobs to the area. The breaking story in the MacRo Report about Kite Pharma’s purchase of 20 acres in Urbana was sent out via email Thursday to the blog’s thousands of subscribers and then shared by many over all of the major social media channels. Don’t miss out on the news, sign up for our weekly e-blast here. Stay tuned to the MacRo Report Blog over the coming weeks for more land and commercial real estate sales data.